Backpacking is an art. It's a science. It's a way of life. To see the world while carrying all your belongings with you, it changes you're perspective on what "living" actually means. It makes you realize that there really is more to life than the things you own. First, backpackers are always on the move; constantly making our way to our next destination. Walking, running, taking buses, trains, tuk tuks, horses, boats and planes, all in furtherance of the ultimate goal: to travel further. In my case, it's always walking. No matter the distance, no matter the weather, no matter the city; walking from place to place allows me to see more of, and in some cases, a lesser known or populated area of the city. Now, of course I'm not walking hundreds of miles (or kilometers) from country to country, but in terms of around each city I arrive in, my go to method of transportation is my legs. Views from the top of Parc Guell. In Barcelona, walking 10 miles from the airport to the city, in Paris from the train station to the apartment I was staying in (4 miles), in Dublin from the airport to the city centre (about 5 miles), and in Amsterdam, from the Central train station to my hostel (6 miles). Anyone can look out a bus window at a rocky road on the way to the city, only the brve choose toi walk that road. Climbing the Tortugas Mountain in Las Cruces, New Mexico. 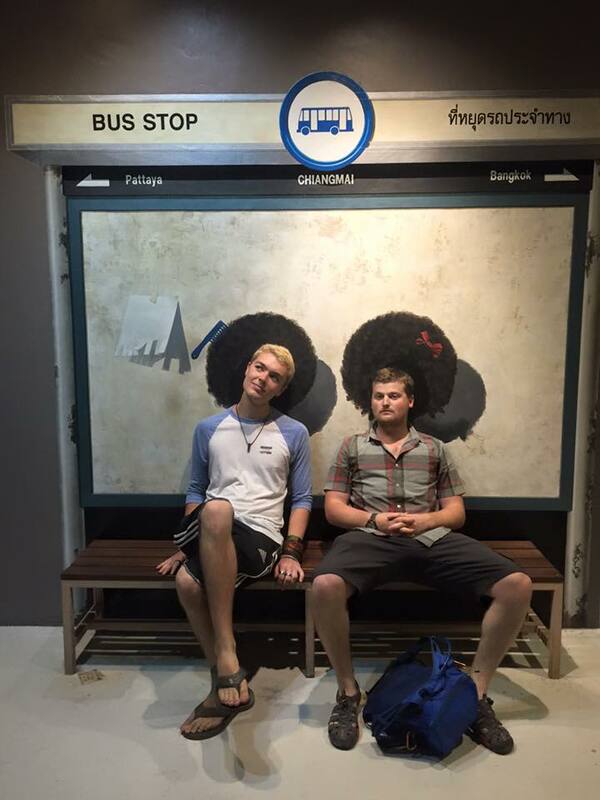 Next, a rule that all backpackers know and live by: take sleep wherever and whenever you can find it. Sleep is a precious thing, and especially when you're spending so much time traveling, can be the difference between an amazing experience or an awful one. However, especially for young travelers (like myself), it can be hard to afford outstanding accommodations for a long period of time, and that's when things get interesting. Personally, I have slept in more places than many people probably do in 10 years. I've slept in hostels, in other people's apartments, on other people's couches, in train and bus stations, on couches and on the floors of airports, in 24-hour restaurants, and even have been completely homeless for a few nights. It's all just a part of the adventure that is backpacking. We are driven by the desire to travel; it pushes us to our limit, gives us energy when we thought we had none, and keeps us from quitting. Which way to the Thai Food? Third and finally, it is important for backpackers to have some sense of direction, or at least know the general direction they should be heading in. This is one that is particularly hard for me, because I have absolutely no sense of direction. You could put me on the ground in any city in the world, and I'd find a way to get lost. However, however a smart traveler would figure out how to use this to his or her advantage. I am a wanderer. I don't like giving myself an exact destination, becausehalf the fun is in getting lost along the way. So instead, I give myself a direction and just wander for a bit. It has worked for me in every city I've traveled to, and it honestly is my favorite way to do things. When you wander, you allow your brain to relax, to not care so much about exact directions, and to just take in the beauty of the environment you are in at that moment. 12,000 FT up on a Volcano in Costa Rica! That's one third the height of Everest! I've wandered in Barcelona, I've wandered in Reykjavik, in Dublin, Paris, London, Amsterdam, and Costa Rica. The beauty of wandering a city is that you get to see areas of it you wouldn't have if you gave yourself exact directions. In Barcelona I gave my self a list of things I had to do while I was there, it pretty much consisted of seeing Sagrada Familia, eating tapas at Quimet & Quimet, and eating authentic Spanish paella. Otherwise, my plans were completely open for anything, which allowed me to see and do more than I would've ever expected. I climbed to the top of Parc Guell and looked out over the entire city of Barcelona, I got to sit on the beach and watch the sunset over the Mediterranean Sea, I even got to go out on a coastal boat tour of Barcelona. None of these were planned; all of them were spur of the moment ideas, living life by the motto: Carpe Diem. Stranded in the Airport, but still looking formal. Needless to say, it is a rough life being a backpacker, but it's also a rewarding one. I think back over the countless trips I've taken and can't believe what I've been able to do. I've made friends from around the world, shared some amazing times is some of the world's most amazing places, fallen in love (a few times admittedly), and I wouldn't trade a single second of it for anything. Getting lost in the maze of walls and corridors of Edinburgh Castle in Scotland. My experience being a backpacker made me realize that life truly isn't about the destination, but rather, it's about the journey. It's about the people you meet along the way, the adventures you share, and making the most of your time on this planet. We get 100 years at best, so make them count.